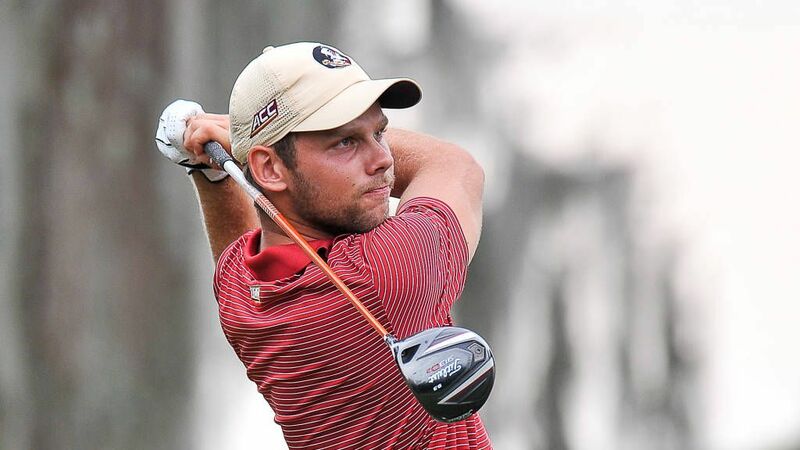 NEW LONDON, N.C. (Seminoles.com) – Senior Rowin Caron’s team-low score of 69 (3-under) in the second round of the ACC Championship highlighted Florida State’s third-place showing on Saturday afternoon at the Old North State Club. Clemson leads the field at 19-under, while Wake Forest sits in second (-11) and FSU sits in third (-5). The final round will be completed on Sunday with ESPN3 coverage starting at 1 p.m. The Seminoles lowered their score by three strokes on Saturday (284), as Caron delivered five birdies including three in his first four holes played. He carded a 34 on the front nine and a 35 on the back end. Caron shot four strokes better than his first-round score of 73, and is tied for the individual lead in par 3 scoring at 2-under. Senior Hank Lebioda is tied for six among all individuals after shooting a 2-under 70 on Saturday. Consistent as usual, Lebioda shot a 35 on the front and back nines, enjoying a sequence on holes 11-14 where he birdied three out of four. Redshirt junior Cristobal Del Solar bettered his Saturday score by one stroke compared to Friday, shooting an even-par 72. He finished his round in stellar fashion with a birdie on the par-5 18th. Freshman Corey Carlson shot a 73 (+1) while junior Josh Lee shot a 76 (+4). Behind the Seminoles are Georgia Tech (-1) and Virginia (-1) tied for fourth, followed by Duke (even), NC State (+1), Louisville (+4), North Carolina (+12), Notre Dame (+15), Boston College (+27) and Virginia Tech (+28). Lee tees off at 9:30 a.m. on Sunday, followed by Del Solar (9:40 a.m.), Carlson (9:50 a.m.), Caron (10 a.m.) and Lebioda (10:10 a.m.).